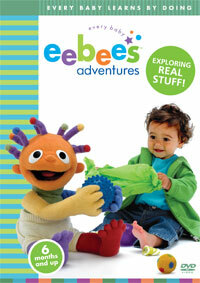 In this series of adventures, EXPLORING REAL STUFF, eebee and playmates explore a range of materials and everyday objects with the simple and enticing goal of finding out what these things are like. “What do things feel like?” “What sounds do they make?” “How do they move?” “Are they heavy or light?” “What can I do to them?” These are just a few of the questions eebee and friends actively take on. Brimming with Ideas sets the adventure among tubs of cereal and grains, adding bowls, scoops, and funnels to enrich the possibilities. In Out of the Box, a paper mountain and a cardboard box encourage infant “science,” “math,” and creative explorations. And different balls, tubes, ramps, blocks and even a tissue box lead eebee and babies to discoveries about rolling, slipping and sliding in On a Roll.